Holy Malmsteen, Batman! 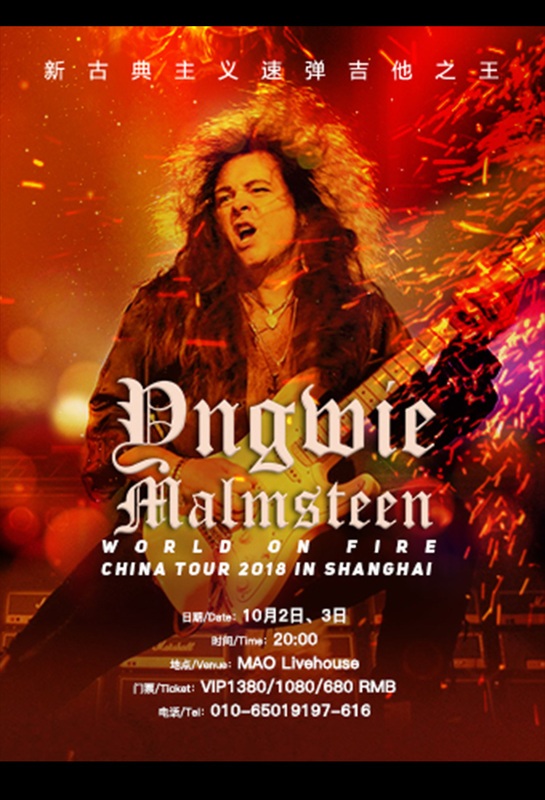 Yngwie Malmsteen, yes, the Yngwie Malmsteen, is hitting up MAO Livehouse as part of his World on Fire China Tour. The Swedish guitarist, rated as one of the 10 greatest electric guitarists of all time, started out briefly with Steeler and Alcatrazz before his skill (and huge-haired personality) jumpstarted his solo-career. Combining staggering, mindblowing classical virtuosity on the fretboard with literal walls of amplifiers (literally, he had walls of amps), Yngwie was at the forefront of the neoclassical metal genre in the 1980s, heavily inspired by Italian violonist Niccolò Paganini and Ritchie Blackmore. The image "80s Heavy Metal God" conjures in your mind is probably Yngwie, and you didn't even know it. The man is intense. In nearly 40 years, he's released 20 studio, starting with the face-meltingly awesome Rising Force in 1984 and Unleash the Fury in 1988. Earlier this year, he signed on with Mascot Records, and has a new studio album on the way, to be released next year. See you in Shanghai, b*tch!